Winter Cyclist: Banger on tour. Holy singletrack Batman! So I am on vacation in the UP. I brought a bike, of course, because if it is worth going, it is worth bringing a bike. A big thank you goes out to Alaska Air, who through extreme kindness or lack of attention flew my bike for free. I arrived to a stable of bikes that were in generally good condition, but needed a little love. I had a bit of fun turning wrenches and getting my bike assembled. My wife shipped her bike here from Portland. She's been commuting on it for three years and it was in severe need of some love. I later found out I didn't give it quite enough. Our ride was ended three quarters of the way through the trail by a slow leak. While this would normally be an easily remedied problem, the fact that my pump decided to be a presta only affair meant I had to ride back to town and the shop for a new pump. Of note is the fact that I am not totally impressed with the local shop. They are adequate, for sure, but they haven't gone above and beyond to make me feel warm and fuzzy. Or maybe I am just pissed because when I went in to purchase tubes, CO2 (you can't get it here on a plane), and other odds and ends, they saw fit to charge me a buck for a quick release spring (my wife lost one of hers somewhere during her bike's horrific life in Oregon). Generally I'd throw that kind of thing in at my shop, but hey, maybe he saw through my smile and figured me out for the jackhole I am. When I was here several winters ago, I rode out at the Fumee Lake natural area. They had some ski / snowmachine / four-wheeler trails that were fairly close to the house and through some nice wooded areas. The park has advertised singletrack, so I decided to check it out. Holy Crap. It is excellent. 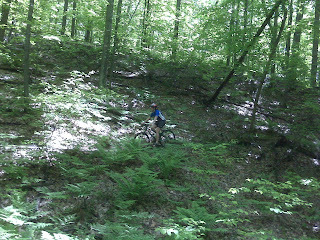 Beautiful carved singletrack through untouched woods. The trail was totally unoccupied save for a few deer that hustled off when the saw us coming. The trail was an excellent mix of fast swoopy sections and technical climbs and switchbacks. 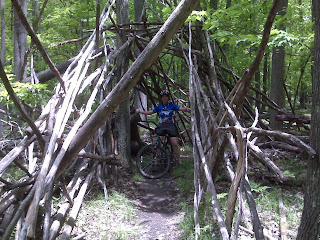 There are also constructed tepees over the trail in several sections, which add a bit of character. I'll be eagerly exploring the area now since if there is one trail like this, it is likely there are many more. We don't have anything of the sort in Fairbanks, so I might as well take advantage while I can. Nice photos. Is that some sort of mountain bike gang hand symbol in the first one? Yar. I think I was actually struck for posting this photo. One of my favorites, but not one of the subject's favorites.